What do an Android tablet, hotel savings, cruise and airfare rebates have in common? They are the exciting elements that comprise our new High Tech Adventure incentive bundle. The High Tech Adventure incentive bundle is a powerful method of attracting business, retaining profitable clientele, increasing profits, enhancing product awareness and improving employee productivity. 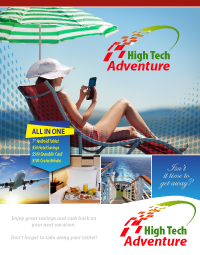 Companies of all sizes and any type of retail, wholesale, manufacturing, Internet, service, distributor or direct sales business benefit from the High Tech Adventure incentive bundle. Why? Because everyone loves to travel. Toss in an Android, the world’s most popular mobile platform, and you’ve got a formula for success. Great value + popular product + customer service = High Tech Adventure incentive bundle… great savings and cash back on airfare or on a cruise vacation plus a tablet to chronicle the trip! 7” Android Tablet – Take photos, keep notes, stay connected. $50 Hotel Savings – It’s like money in your pocket. $500 GrandAir Card – Cash back on airfare. $100 Cruise Rebate – Need we say more? To learn more about how the High Tech Adventure incentive bundle can improve acquisition, activation, retention, and renewal, call 941.552.7885 or email sales@grandincentives.com.